Salmo Executor: This lure is primarily designed for freshwater predators but in its shallow running (SR) versions it lends itself very easily to the Bass market. Both the 5cm and 7cm shallow running models run between 0.5m and 1m deep and have a great action which makes them perfect for working shallow, rocky or weedy areas. It’s freshwater applications are endless, in either the shallow running or deep running (SDR) this is a superb trolling lure which as you can see from the pictures are an excellent bait fish / fry silhouette. 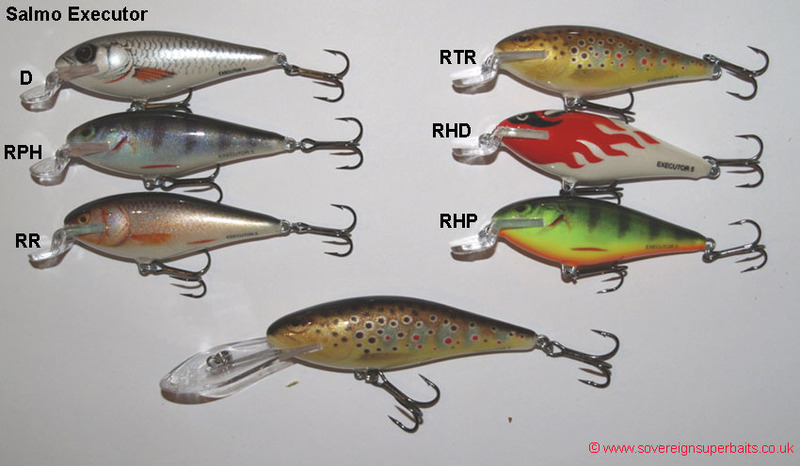 The picture shows all the colours in 5cm shallow running (SR) and the “real trout” in 7cm deep running. Both shallow running models have the stepped bill and both deep running models have the straight bill. The 5SR weighs 5g, comes with two Size 8 VMC 9649 trebles, dives to 0.5m on the crank and about 1.2m on the troll. The 5SDR weighs 6g, also comes with Size 8 trebles, runs down to 1.2m on the crank and 2.5m on the troll. The 7SR weighs 8g, comes with two Size 5 VMC 9649 trebles, runs down to around 1m on the crank and 2m on the troll. The 7SDR weighs 9g, also has Size 5 trebles, runs down to around 1.5m on the crank and down to 3m on the troll. Our initial testing in Holland with this lure in August 2008 brought us a broad range of species of good sizes before becoming stuck in a snag. This lure is highly recommended for both ultraliting and Bass fishing and we are convinced it will prove to be one of Salmo’s best introductions. Salmo Frisky: This lure is only available in Floating, it is however very low buoyancy giving it a slow rise on pauses, this makes it equally suitable for casting both upstream and downstream. On the cast the SR version will run down to almost 1 metre and will reach 1.5 metres on the troll. The DR version with its larger straight diving bill will make up to 2 metres on the cast and 3.5 metres on the troll. It is 7cm in length, is furnished with 2 x Size 6 VMC 9649 trebles with the SR weighing 8g and the DR weighing 9g. 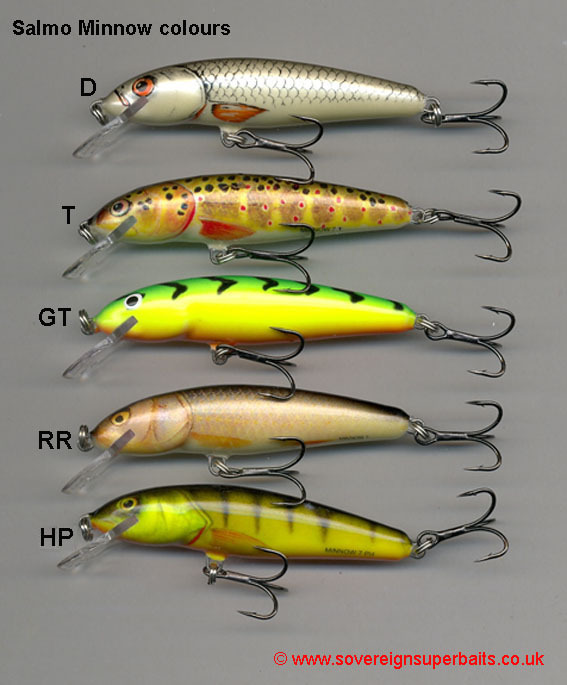 This lure is equally at home in freshwater and will catch just about any predator that looks at it.